Oc. 19, 2005 — As the night approaches for the surreal and bizarre to rise up once again, the Grand Hyatt Seoul presents a pure-treat-no-tricks Halloween package including bewitching accommodations to help its Halloween guests prepare for and recuperate from JJ Mahoney's renowned "Halloween Party 2005." Prior to an evening of mingling with a haunting cast of ghouls, the Halloween package provides its spooks in training with complimentary use of the hotel's indoor swimming pool and gym during the day. Then as the sun starts to set, special Halloween accommodations await, as guests transform themselves into creatures of the night. Each room offers a broomstick ride view of the city's twinkling lights through its floor to ceiling windows. And once the metamorphosis is complete, complimentary invitations for two to the best Halloween party in the world at JJ Mahoney's, await each goblin. 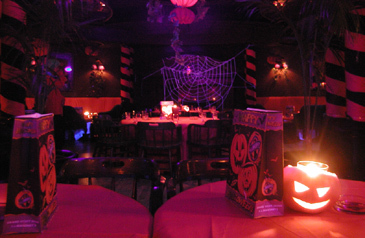 JJ's, the birthplace of the "Halloween Party," will be all decked out for the night in a color scheme of black and orange, populated with different shaped pumpkins and fluorescent lighting, creating a bizarre yet brilliant luminance. A cauldron of events has been prepared for the occasion, including Halloween costume contests, lucky draws for roundtrip tickets to Hong Kong, live music, nonstop dancing to JJ's band "EXIT-T" and much more, all designed to enhance the Halloween spirit. Hours: 6 p.m. to 3 a.m.